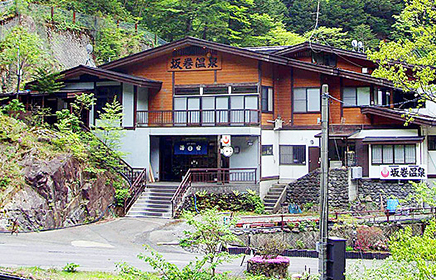 A Japanese style inn with abundant natural hot spring. A Solitary inn surrounded by the virgin forest of Japanese beech trees. 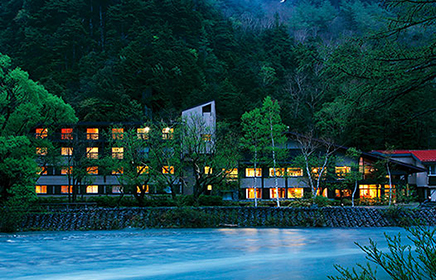 This hotel is a landmark of Kamikochi, being the only hotel standing along the shore of Taisho-ike Pond. From the restaurant, one can gaze up at the sky and out toward Mt. Yake-dake and Taisho-ike Pond below. Located at the start of the nature trails in Kamikochi, this area is excellent for those who wish to take pictures and go trekking. 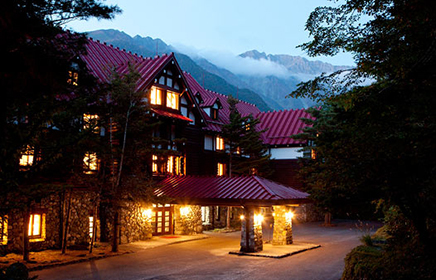 Built in 1933, the Imperial Hotel (Teikoku Hotel) is the most prestigious accommodation in Kamikochi, offering a combination of mountain lodge atmosphere and first-class hospitality services. 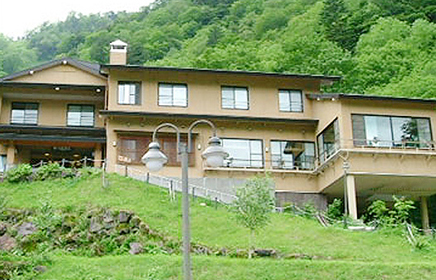 Established in 1830, this hotel has seen and experienced several lifetimes worth of events in Kamikochi. One can relax by experiencing the natural hot springs that were found flowing out of the ground here at 1500m. This hotel is also known for being proud of its menu based on local foods. With a welcoming atmosphere, natural hot spring baths, spectacular views, and genuine French cuisine, this hotel offers a comfortable stay in a relaxing environment. 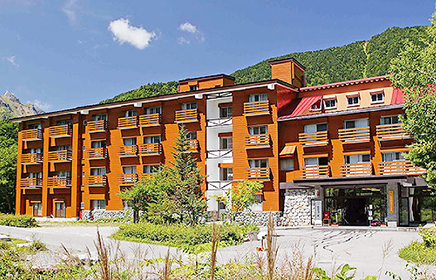 Enjoy the breathtaking view of the crystal clear Azusa river and the majestic mountain ranges from your room. 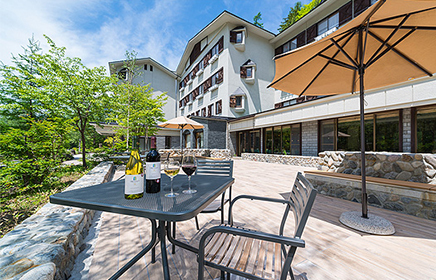 At Kappa-bashi Bridge in the heart of Kamikochi, this well-established hotel can be found. 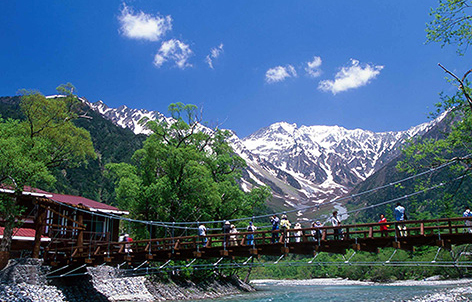 The rooms which face the Azusa-gawa River are blessed with the best views in Kamikochi. The carefully-selected ingredients used in this hotel’s French food award it with the name“Gosenjaku Cuisine”. Customers are guaranteed to enjoy this fabulous cuisine. This resort hotel, standing at the foot of Kappa-bashi Bridge, is popular for the great view of the North Japanese Alps from its cafe and its original Japanese sweets. Meals are made from seasonal foods the area and served in traditional courses (kaiseki-ryori) or modern French dishes. 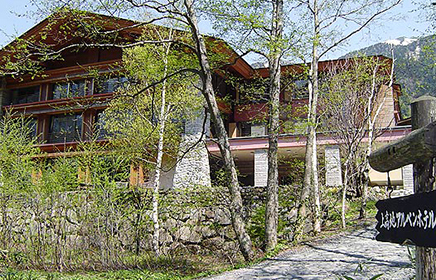 This hotel is also responsible for establishing the Nature School and Kamikochi’s guide service. 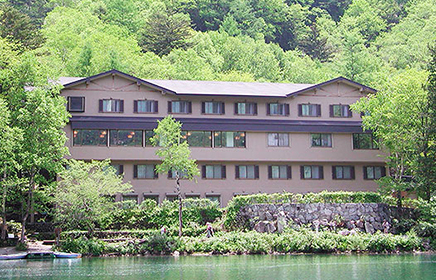 Remodeled in 1993, this hotel is located between Taisho-ike Pond and Myojin-ike Pond. With the peaceful sounds of the Azusa-gawa River, this area is truly relaxing and is optimal for walks. The morning views of Mt. Yake-dake and the evening views of the Hotaka mountain range dyed by the setting sun are spectacular.